The Man from Independence as backdrop for Missouri Democrats' unity rally. Scene is old Independence town square. The Missouri Democratic Party picked a symbolic location to draw support for the Fall campaign. 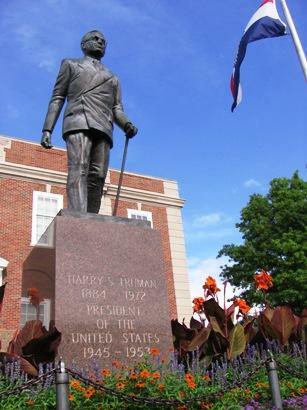 Observers watched and listened by the statue of Harry Truman on the old Independence Square. It was an odd gathering. Winners of Tuesday's primary were introduced. But all three candidates for the Democratic nod for attorney general were on the platform, not unlike a wedding with three grooms or three brides. State Senator Chris Koster was there, who won with about a thousand vote lead over Representative Margaret Donnelly. She too was on the platform and speaking. Donnelly has the right to call for a vote recount and is waiting for the totals to be certified before revealing her plans. Third place finisher Jeff Harris also spoke. Congressman Emmanuel Cleaver emceed a platform of people from every conceivable state office who is a Democrat. From Secretary of State Robin Carnahan to her congressman brother Russ, to incumbent Auditor Susan Montee, who is not running this time. She told the gathering, "We have a higher unemployment rate here in the state of Missouri than the national rate so its affecting us more, we've lost 20 thousand manufacturing jobs since 2005 .We can't afford another four years of what we've been going through and that's why we have to elect Barack Obama." The crowd was thin in size, perhaps a hundred people, mostly from unions: UAW, Teamsters, Communications workers of America and Pipefitters.